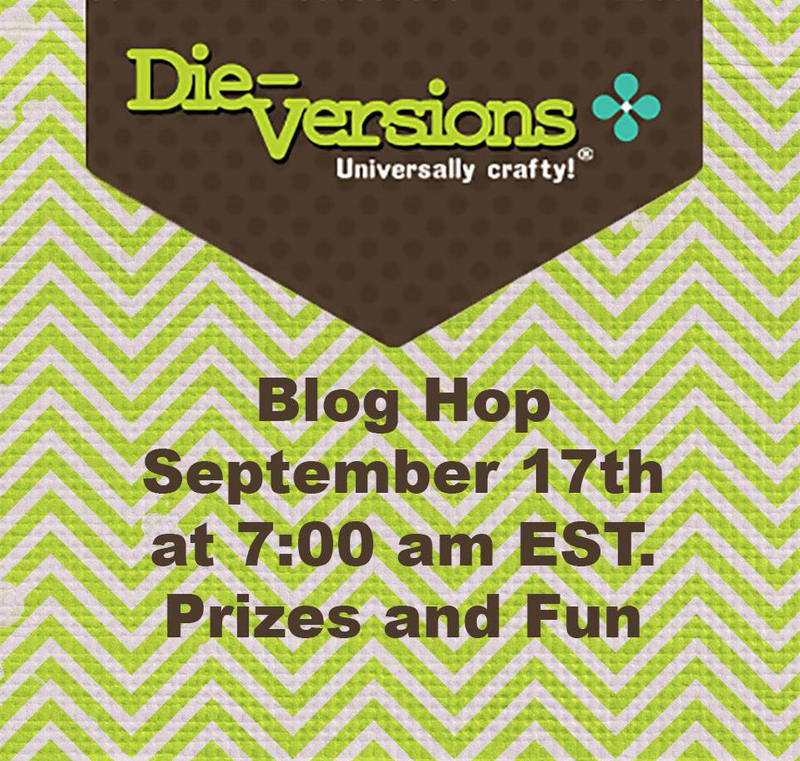 Welcome to the Die-Versions Blog Hop. You should have arrived here from Mary's blog , but you can always go back to the beginning here, if there is a broken link. I absolutely love this Edge die "Believe". So much so, that I cut it four times in an ombre effect. The Jingle Bell is just the right size for card makers, and I really like how you can color it, stamp it or just leave it plain. The silver cord I added here is from Kreinik (you will find it in the sewing section of your local craft/sewing store). I used Blue glitter glue and Silver Liquid Pearls on the bell also. (You know I can't hardly make a card without my Liquid Pearls). Of all the zillions of stamps I have, nowhere to be found was the little bit of sentiment I wanted to go with the Believe die, so I made it with my Silhouette software. I hope you are enjoying yourself today. 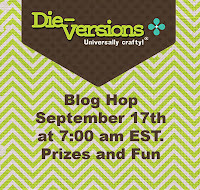 Don't forget to leave a comment on each stop of the hop to be entered into the drawing for the $50 gift certificate to be used at Die-Versions. Your card using the Believe edge die and the Jingle Bell die is beautiful. Love the blues and silver color combination. Wow what a lovely card, love the blues and the sparkles! Your card is great!!! Love the edge die and the bell die!! The ombre effect is gorgeous! Love the edge die, and especially the jingle bell! I really like the ombré effect you used and hanging the glitter bell is just the right touch! Great card! Thanks! LOVE, LOVE, LOVE, LOVE your card. I have a few edge dies but had not thought of layering them. Thanks for the inspiration! Wow, what a fun card! Love the bell. Thanks for the ideas. Love your very pretty card! Love the graduating blue believes. And you lovely bell, WOW! Fabulous card and design! Love the Express Edge cut multiple times. Creative way to layer your BELIEVE die! Love it! wow how clever is this! Absolutely love how you made this card with the layered BELIEVE die!! Simply beautiful!! Oh I love the believe die! And the jingle bell is so cool! Thanks for sharing these! Love your Christmas card. TFS. I really like the blues that you used. They make the card look very dramatic. Wonderful. I really like the icy/winter effect of this card! Love how you used the edge die repeatedly! Gorgeous card! Love the layout...especially the bell! Certainly my favorite so far. Head and shoulders above all the samples! Love the believe!! Gorgeous card!! Beautiful card! 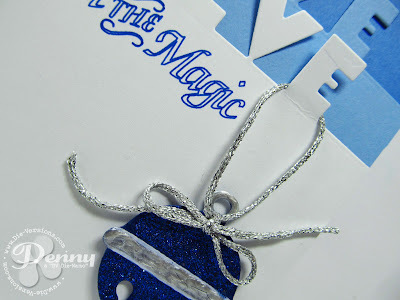 I love the ornament die and the gorgeous blue you used. That detailed leaf die is to 'die' for... Fun Card! What a great card, so stylish! I'm sure to try this for myself: 4 times cutting an Edge-die in a slight different colour..
Love the 'Believe' on your card...very inventive way to use it! I love the card. The jingle bell stole my heart. It is a must have. I better order one soon before they are gone. Uh-ohhhhhhhhhhh. I'm in trouble, now that I've seen this too-cool edge die! I have no idea how to choose a fave new die now ... 'cuz this is another fabby one! What a sparkling Blue-tiful Card. Love those colors and those dies. Bravo! Clean and cool. The colours would also be good for a Hanukkah card. I 'Believe' that your card is a total knock out - love the repetition of the word and it looks fabulous when combined with the ombre effect. Thanks for sharing your awesome creativity with us! Haven't tried an Edge Die as of yet but this is a fantastic idea. Thank you for sharing. Oh Penny... your card is simple elegance. LOVE IT! Wow - would not have thought of stacking these this way. Great card! 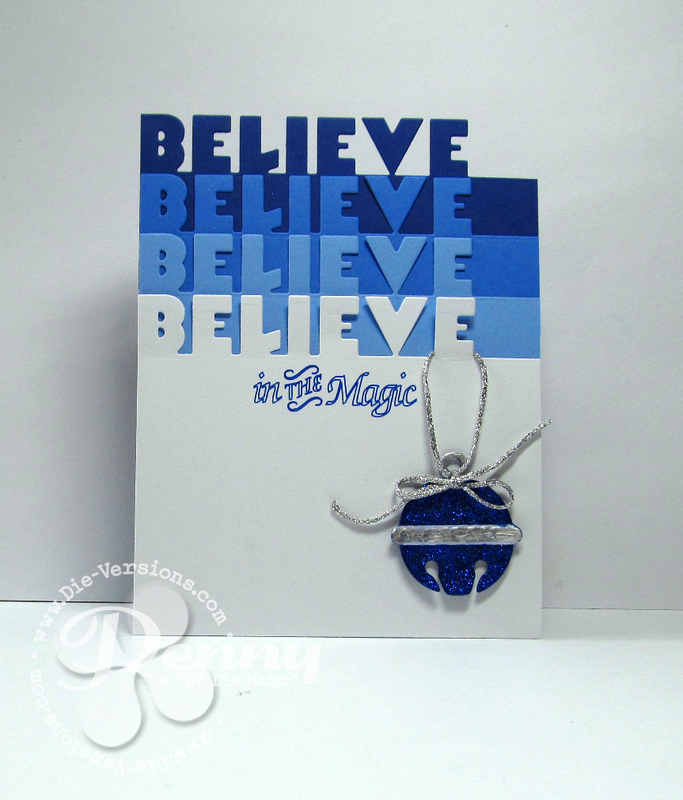 Totally awesome effect you have achieved here with this border die, Penny! LOVE your card....such a cool look! I never would have thought of that ombre look, and it delights the eye! Beautiful card. I love how you cut believe out 4 times in different colors. So cool. The jingle bell is awesome. Love the sparkles. Nice card Penny...love that border die and glitter is always necessary!! Love this card. On my to do list! Cute, cute card and I think both the believe and the ornament dies are must haves. Oh my... I love this card!!!!! wonderful card! Clean and simple as well as most charming! Nice idea, too. What a fabulous card! I love the bell and way you used a ombre technique with believe. Super cute card! Love the ombre effect! !